Dance Theme Class Hen Party Aberdeen. Brilliant! The weekend was great, everyone had a brilliant time! Dance class was fab. The bride really enjoyed herself and everyone really put an effort into the ‘neon’ theme which was great. We need to say a big thank you to the dance class teacher! (Can’t remember his name) sorry! He was absolutely brilliant and provided us with fun and laughter throughout. Thank you!! Leeds Dance Theme Class Hen Party & Tapas Meal. Fun & Giggles! Yes I am just about recovered from Leeds. We all had a great time and Katy suffered appropriately the following morning only managing to push her breakfast around her plate. Overall we have been very impressed by the service your company offered and everyone thought the package was good value. The hotel was well located, the rooms were great and well equipped and the breakfast was lovely. The dance class at Tiger Tiger was very funny and the lady running the dance session was good at explaining what we needed to do and looked after us well. Chicago Dance Theme Class Hen Party. Perfect! Haha yeah were all recovered. Everything went perfectly! Everyone really enjoyed themselves so thanks for everything! Posted some reviews and here’s a picture. We were one cane short so that’s why I’m holding a brush haha. Definitely made for a hilarious dance . We had a lot of fun. Can’t thank you all enough, incredible customer service! Belfast Single Ladies Dance Class & Naked Life Drawing Hen Party. Fantastic! The girls and I had a fantastic time doing our 80s dance class, lots of singing along to the classics and pretending to be the next Kylie! Jay was a fantastic help in booking our class and made sure that any questions we had were answered straight away and made the effort to call and make sure we were ready to go, couldn’t have asked for better help. Top afternoon! An easy, cost effective way to book even the most complex hen do! Very friendly staff and so accommodating, thank you for making my job easier!!!! Great fun and as described and we had such a giggle doing the dance lesson and the cocktail making. 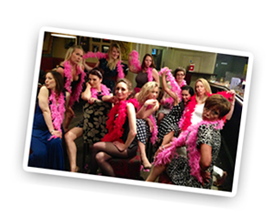 Dance hen parties were reliable and took time to tailor the hen party experience to our needs. Clare our Glee dance instructor was amazing and very patient. She laughed along with us and we came away buzzing! We had a great time at the activity thanks! The instructor was really energetic and it was loads of fun! Easy to book and helpful! Very easy to book and really helpful on the phone. Only company who could actually give specific details of hotel and meal venue etc. Good communication via email to keep track on payments. We all had a fantastic time! Very pleasant and helpful on the phone, even when we change our mind! Our Customer Reviews have been built up over many years by providing outstanding customer service.